The Latin word fama means 'rumour', 'report', 'tradition', as well as modern English 'fame' or 'renown'. This magisterial and groundbreaking study in the literary and cultural history of rumour and renown, by one of the most influential living critics of Latin poetry, examines the intricate dynamics of their representations from Homer to Alexander Pope, with a focus on the power struggles played out within attempts to control the word, both spoken and written. 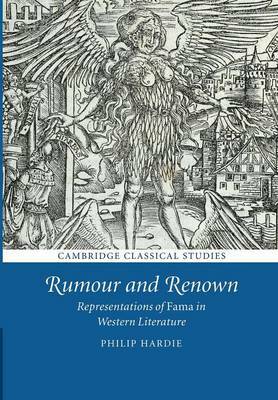 Central are the personifications of Fama in Virgil and Ovid and the rich progeny spawned by them, but the book focuses on a wide range of genres other than epic, and on a variety of modes of narrating, dramatising, critiquing and illustrating fama. Authors given detailed readings include Livy, Tacitus, Petrarch, Chaucer, Spenser, Shakespeare, Ben Jonson and Milton.